Gennady Golovkin is at the moment best priced as a 12-1 favourite to beat Daniel Geale when the pair of 160 pounders face off in just over 10 days at Madison Square Garden, New York. Now I want to try to break this down bit by bit. Firstly, Gennady Golovkin may be more hype than actual talent but looking at the top 10 rates fighters, he is the only one to have destroyed someone in the rankings. Relative performances indicate that you can believe the hype. Sergio Martinez has a victory over Matthew Macklin but was knocked down and took 11 rounds to win. Golovkin stopped Macklin in 3 with one punch. Macklin is a decent barometer of how good you are in the middleweight division. This might seem like a little bit of musical chairs but stay with it. Martin Murray (rated 9), Matthew Macklin (rated 7) Felix Strum (rated 6) Sam Soliman (rated 5) Sergio Martinez (rated 4) Daniel Geale (rated 2) has seen 7 separate fights. Martinez holds the most outstanding record having never been defeated by any of his opponents but did lose to lineal champ Miguel Cotto last time out. The point is, most of these fighters mentioned, Cotto aside, is roughly as good as each other at this point (taking into account the diminishing Martinez rather than the dominating one of years gone past). 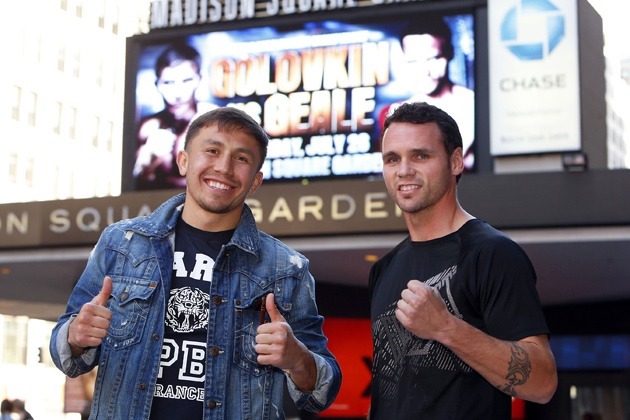 Geale may be the most elusive of all of these but it would seem to matter little to Golovkin. If it takes Sergio 11 rounds to get Macklin out of a ring and it takes Golovkin 3 then we can’t expect Geale to last either but the Aussie is smart and I doubt will trade or leave himself as open as previous opponents. Golovkin is scarily good and this fight should really only serve as a further step towards a super fight no matter how smart Geale is or will be on fight night. Whether someone like Miguel Cotto wants the fight should Golovkin win is another question. I suspect he would have to look in the weight class above to see for potential match ups. There are 8 opponents that would make for interesting match ups with GGG at Super Middleweight but I doubt many would want to make the fight. I seriously doubt someone like George Groves or Jame De Gale would get in with him as they seem to have their paths relatively set and wouldn’t take a step in the direction of Gennady if other options are available. I think the same is true of Arthur Abraham and Robert Steiglitz. Sakio Bika may be an option as he is looking for a big fight, is very durable and I doubt whether a defeat would send his career down any kind of awful path as he is experienced and has defeats on his record already. Mikkel Kessler and Carl Froch are possible options (Froch has been mentioned in the past) as they both are used to fighting big fights are wouldn’t be as intimidated as the aforementioned fighters at Super Middleweight. Andre Ward is very interesting. His inactivity and ongoing promoter problems has made it hard for him to get in the ring but his last outing showed how good he still is. However it seems tricky for Ward to land a big fight even without these problems due to a lack of competition. A Ward vs Golovkin bout would solve this problem though. Ward is possibly the most talented boxer in the world out with Floyd but even he would have trouble with Golovkin assuming he is what most think. Even a dominating performance going into the later rounds would give GGG a chance with his concussive power. Personally I like Daniel Geale but Golovkin will win with ease though I’m sticking my neck out and suggesting that Geale lasts the distance and loses a wide decision. Golovkin will run out of opponents and options by the year-end and will have to make moves. At 32 the clock is ticking. I really just hope for his and our sake as fans, that if he does impress against Geale it doesn’t make things more difficult for him as the only thing fans really want to see is Golovkin taking on the best opponents he can.